My husband and I have a really odd problem for a San Francisco apartment……we have almost too much space!!! We have vast expanses of huge white walls and just not enough art to fill them, (I know, I know, whaaa whaaa) so we’re trying to think of some creative solutions to add visual interest while we accumulate pieces that are meaningful to us. Since I’m not from the West Coast I didn’t grow up with earthquakes so they freak me out!!!! 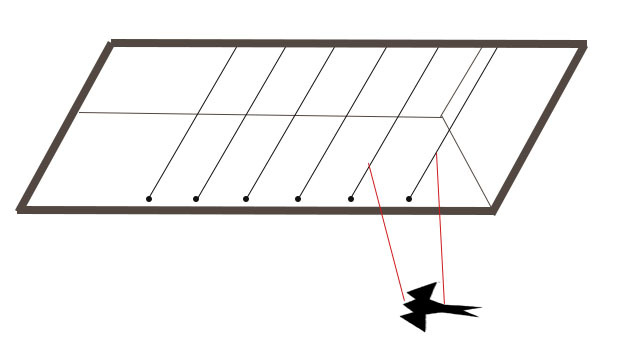 I’m ultra-earthquake safe in designing the apartment (except our death-trap project/storage room – more on that another day) and this includes not hanging anything heavy or breakable above where we sleep. So. 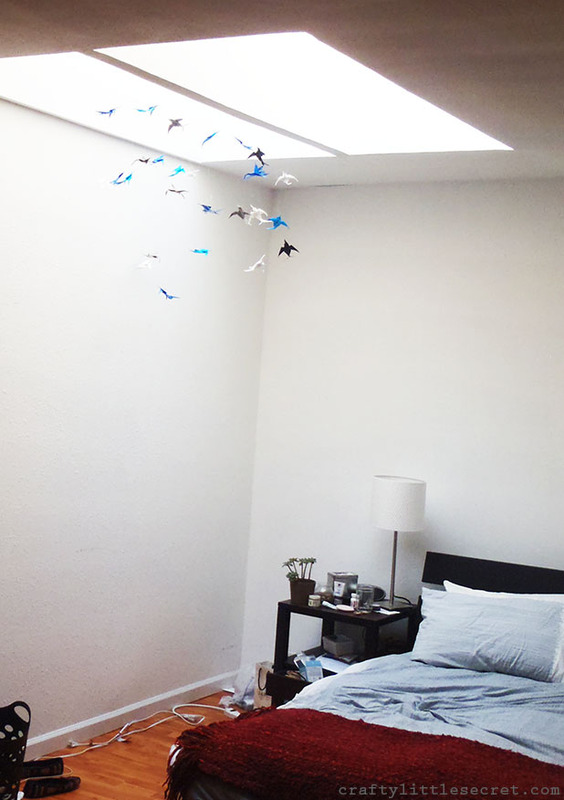 This week I added an origami paper swallow mobile to draw attention to a great feature of our apartment – the skylights. It was a little finicky dealing with the invisible thread overhead, but ultimately not too difficult to pull together and they definitely won’t crush us in our sleep if there’s an earthquake. So, there’s that. 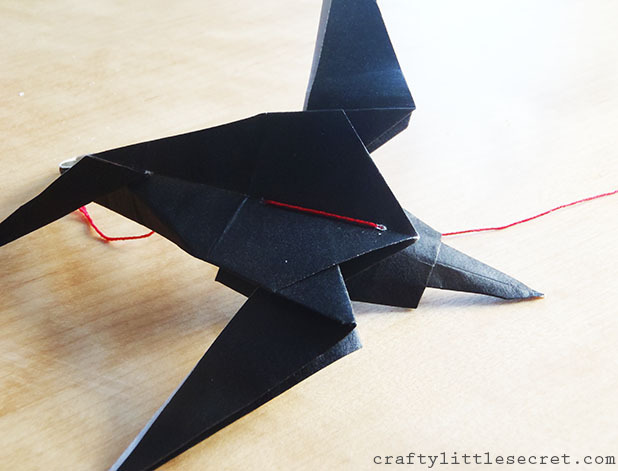 All you’ll need for this project is some origami paper, invisible thread and some pushpins. 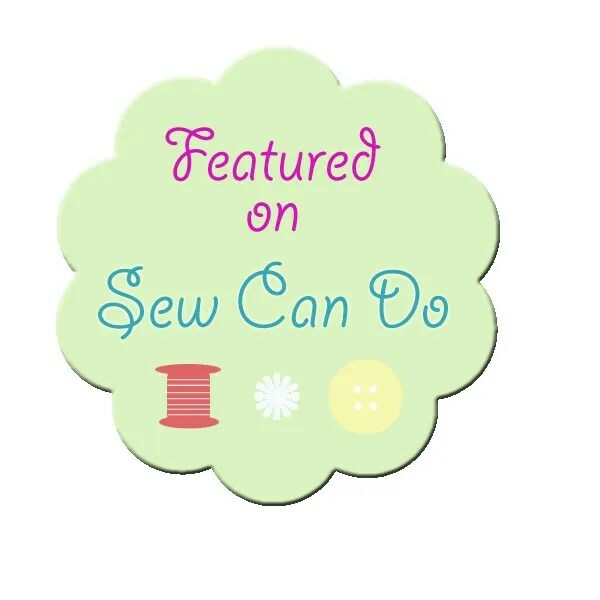 I used actual thread as opposed to fishing line because I wanted it to be as thin and invisible as possible. I was worried the fishing line might catch the light a little too much. 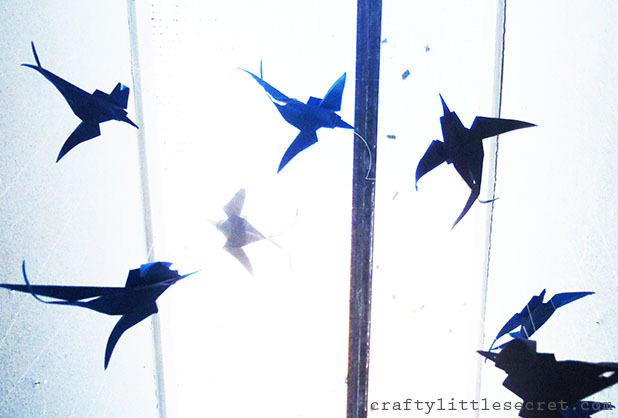 First, I made about 35-40 origami swallows using shades of blue, white, black and grey. 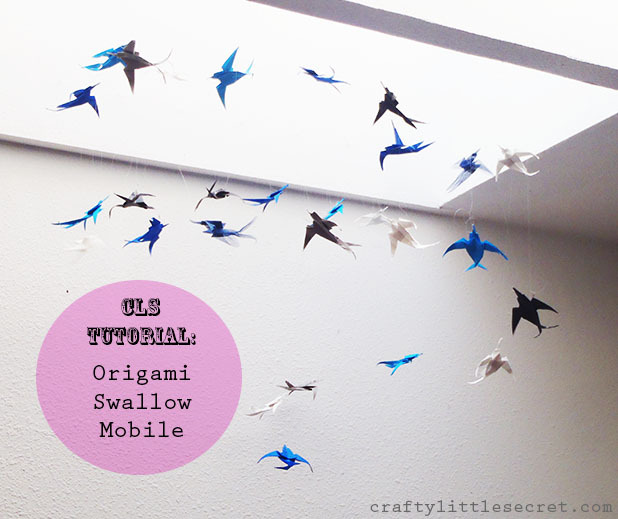 I found that one package of origami paper (plus a couple novelty sheets) was enough to give me this many swallows. This is great to just pass the time idly with some trashy Netflix on. 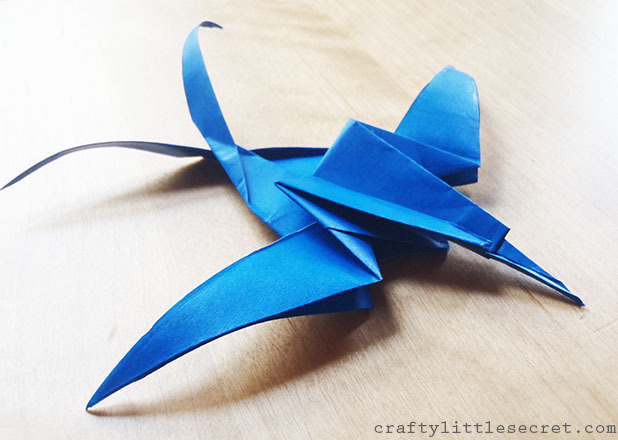 I used this tutorial to fold the birds, which builds upon the basic origami square base and bird base. 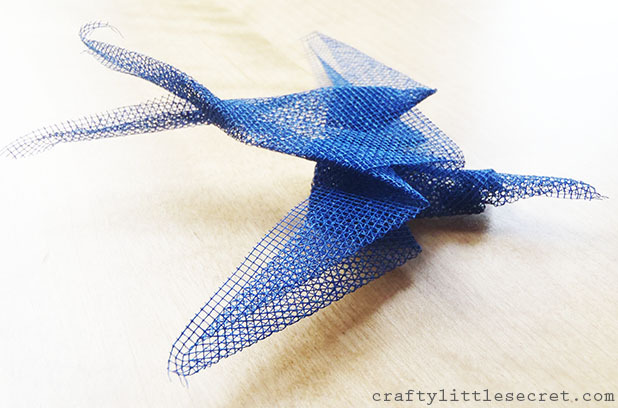 I used traditional origami paper but also found some really cool mesh paper (available here). The only drawback was that I found the mesh paper difficult to fold and had to really press each edge to make the folds stay. I attached the thread used to hang the swallows at the front and back of the bird’s torso (according to the photos below). I found that with just a single point, it was too difficult to find the center of gravity and keep the swallow parallel with the ground. 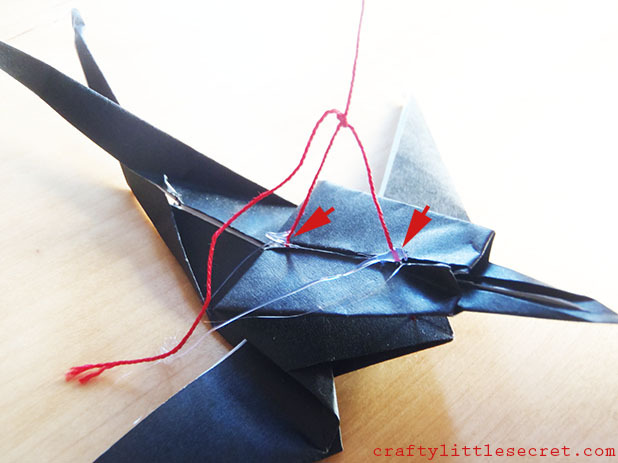 I strung up this bird using red thread so you could see it, but for the actual mobile I used invisible thread. 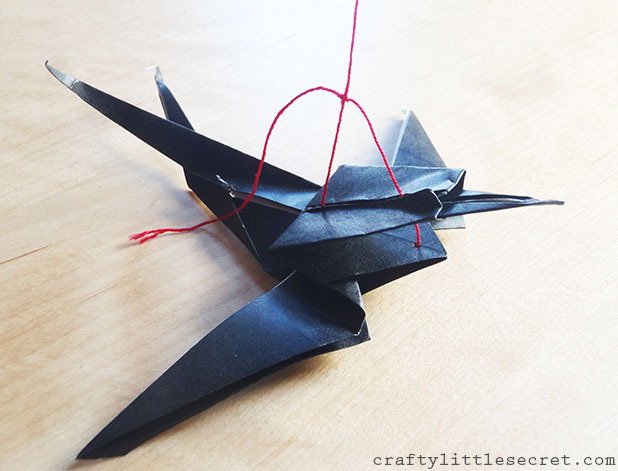 I found that even with this method of tying the birds, some of them still wanted to slip and end up with their noses up and their tails down, perpendicular to the ground. To keep this from happening I added a dollop of hot glue at the base of each thread just to hold it in place. 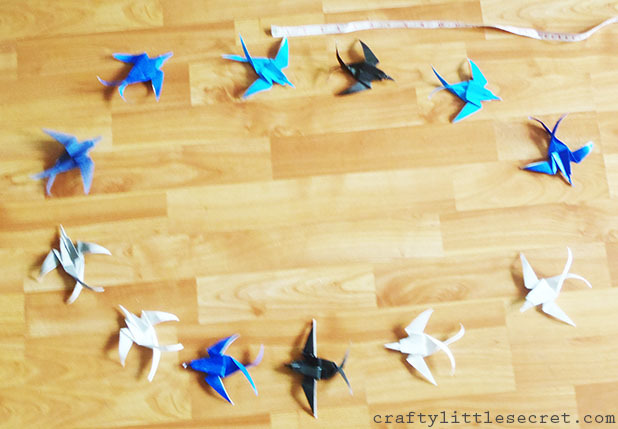 To hang the birds I first laid a few out on the ground to figure out what kind of spacing I wanted. 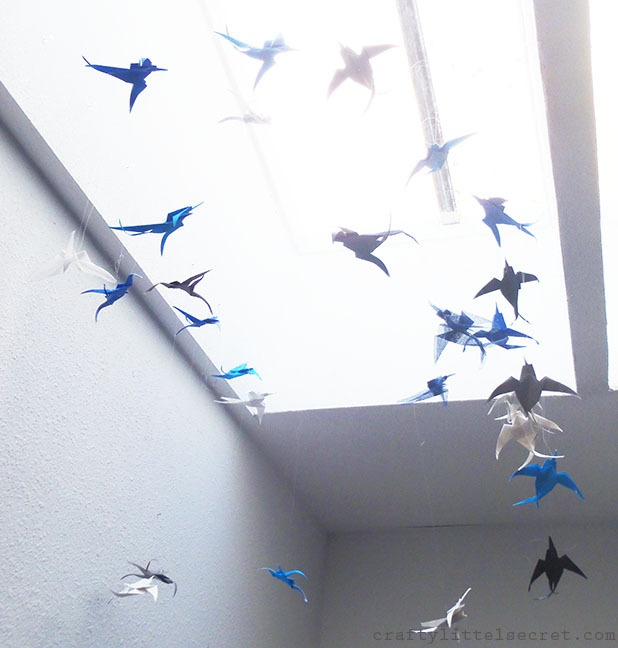 I decided that I wanted the birds to look like they were flying upwards into the skylight, so I arranged them in a circular pattern. Sorry for the blurry photo, I guess I had my camera on the macro setting still. Whoops! I found that I liked a spacing of about 6″ between the center of one bird and the next with a total of 6 birds making up the diameter of the circle. 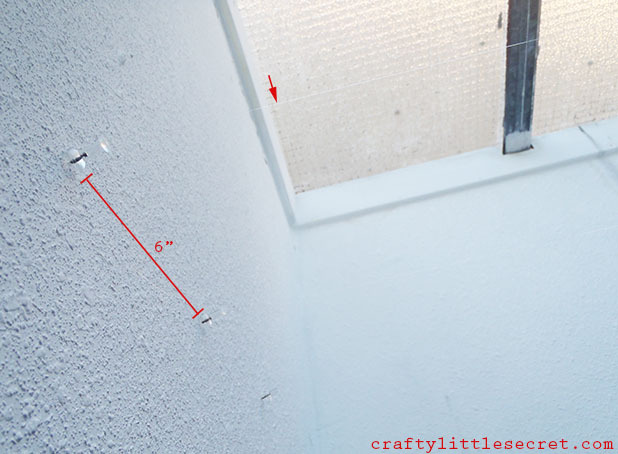 To start constructing the mobile itself I put clear pushpins into each side of my skylight every 6″ and connected side-to-side with the invisible thread (super hard to see, so it’s the arrow in the picture below). 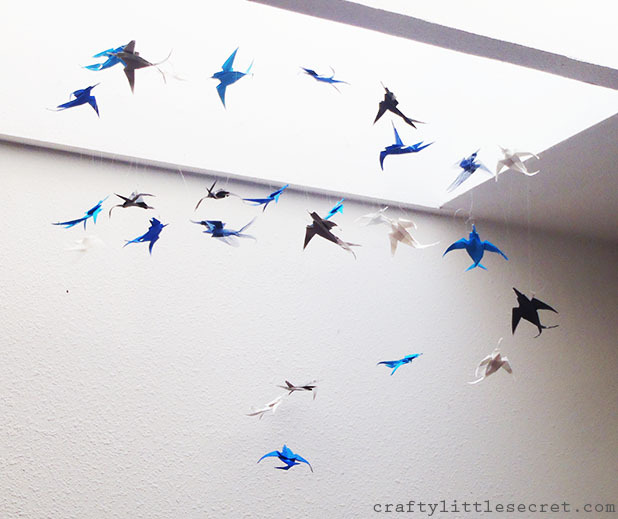 I then started stringing up my birds, decreasing the length of the thread they were hanging from as I wound the birds in an upwards swirl into the skylight opening. As I was doing this I was having trouble making the birds all face the proper direction. 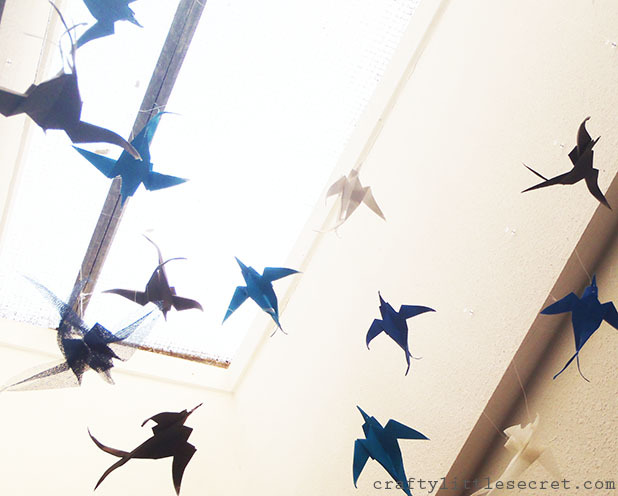 I mean, one can’t have their paper swallows flying all over the room now can they?! To remedy this, I added a second thread attached to the birds’ head and attached that thread to the cross-thread ahead of the cross-thread that the body was attached to. Clear as mud, right? Here’s a picture to help illustrate what I mean. This kept all the noses facing the right direction. 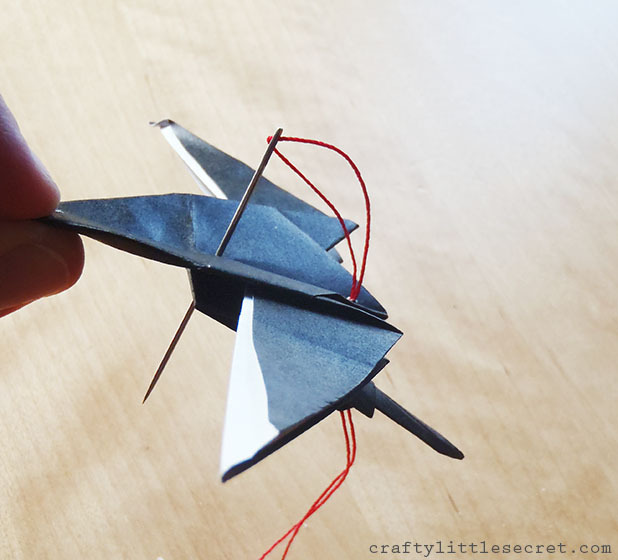 If you want your birds flying in a specific pattern like mine, I’d highly recommend adding the head thread before you start hanging the birds. With such fine invisible thread and looking up into the sun as I worked there were moments that I literally couldn’t see the knots I was tying and was operating blind. 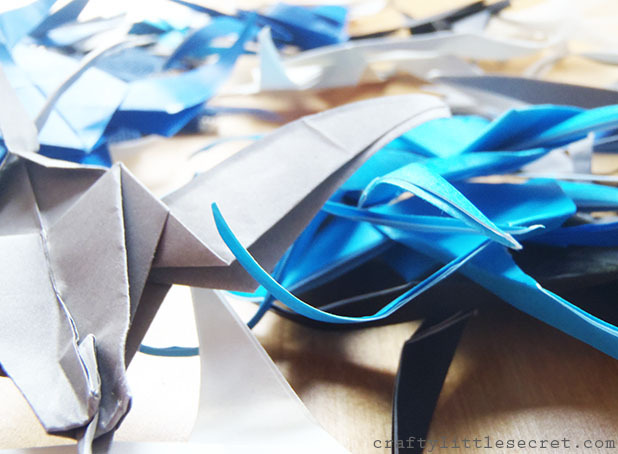 Adding the head threads to the birds at this point resulted in much Bleepity-bleep-bleeping! All in all I’m pretty happy with how the mobile turned out, and I love that the birds end up shadowed against the light when you look up under them. Doesn’t the mesh swallow look really cool against the light?? With the exception of the first night, when I rolled over and looked at the shadowed birds against the dark sky and decided it looked like a scene from Alfred Hitchcock’s The Birds, I’m really happy with my new mobile! 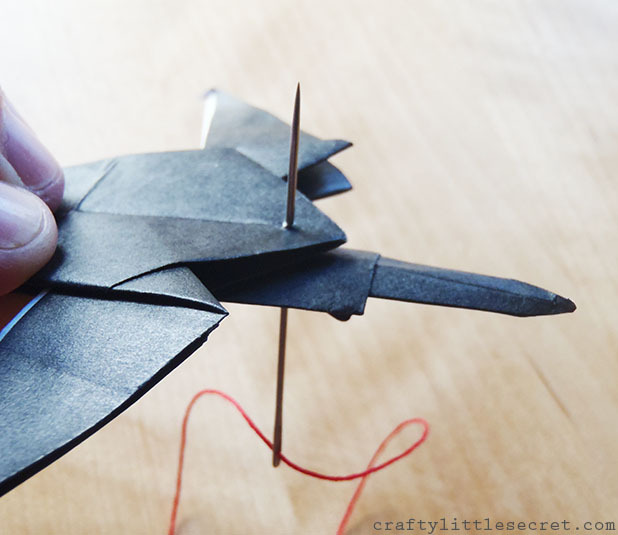 This entry was posted in Uncategorized on November 14, 2013 by missphd.